Can you believe it–another post already? I could have sworn that I posted this a long time ago, but I don’t see it in the archives. This is “To Your Good Health from the House of Squibb,” from May 17, 1944. As always, Lyn Murray directs the Squibb orchestra and Chorus of Stars. Betty Mullener is the featured soloist. Here’s another episode of “Music from the House of Squibb,” this one from February 25, 1944. 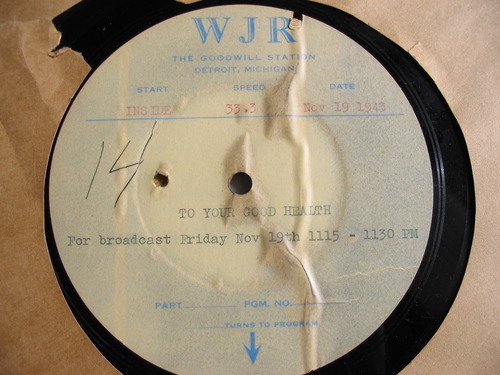 Here we have another of what must have been one of my grandpa’s favorite programs, “To Your Good Health from the House of Squibb.” This originally aired on May 31, 1944. As always, we have Lyn Murray directing the Squibb Orchestra and Chorus of Stars. The guest soloist is Hubie Hendrie. I’m back! Hopefully my computer will continue to work for a while now. 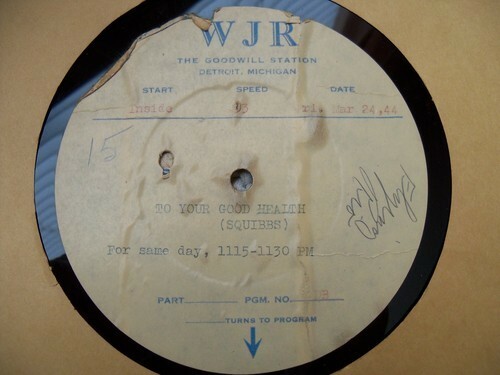 This program is, I think, the day that Squibb changed the name of its show from “To Your Good Health from the House of Squibb” to “Music from the House of Squibb.” What’s interesting, though, is that the record label still says “To Your Good Health,” like maybe the affiliates didn’t know about the name change. It’s also the day after D-Day! The programming was obviously changed to reflect what was going on in the world, as this is a whole show of patriotic tunes. A couple of times in the recording you’ll hear a series of beeps. Those are on the original record, not a digital problem. I’m guessing maybe they’re some kind of alert signal for news updates, or something along those lines. I’m sure somebody will be able to tell me exactly what they are! Here’s the direct link to my bandcamp page for this show. “To help you relax and renew the energy all of us need these days,” here’s a recording of To Your Good Health from the House of Squibb. Lyn Murray directs the Squibb Orchestra and Chorus of Stars, with Hubie Hendrie. Here’s the link to the download page for screen readers. I’m planning to take a little break from Grandpa’s iPod for Christmas, but don’t go away—I’ll be back soon with more unique radio programs!